This B&H Kit combines the Numark PT01 Scratch Portable Turntable with the Mixfader - Portable Bluetooth Wireless Fader, a dock, and a protective case to create the ultimate portable scratch turntable for touring DJs and impromptu performances. 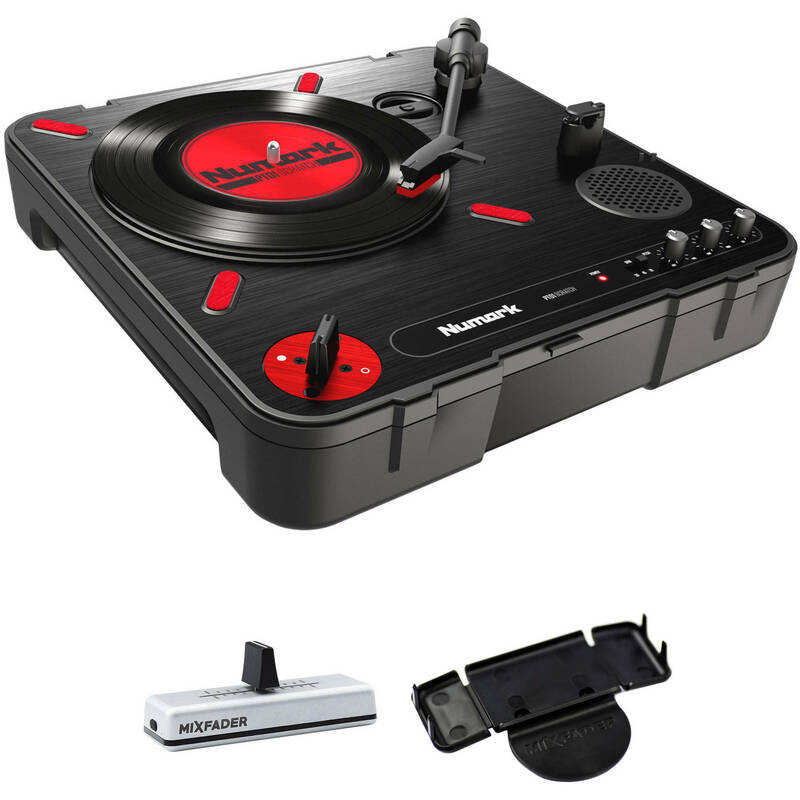 The Numark PT01 Scratch is a durable portable turntable designed for the turntablist on the go. The deck can be used to complement any portable PA system, to listen as a standalone, or for impromptu performing. The PT01 Scratch is a compact AC- or battery-powered turntable with an accurate belt-drive motor. The integrated scratch switch allows any turntablist to perform anywhere. The switch can be adjusted for left or right handed use and is user replaceable. The USB output provides a direct connection to computers for archiving vinyl. A built-in speaker enables monitoring right from the turntable and line-level RCA output connections, which allow the PT01 Scratch to be connected into any line-level input. Line-level output eliminates the need for an amplifier with a phono input and is useful for direct connection to CD recorders, soundcards in computers, etc. Additional outputs include 1/4" headphone and 1/8" mini headphone outputs. The PT01 Scratch is an ideal solution for the mobile turntablist for performance or crate digging. The Mixfader - Portable Bluetooth Wireless Fader is a device designed to connect to your phone, tablet, or computer and control crossfader, pitch, and audio effects. The unit utilizes Bluetooth 4.0 and works with the free Mixfader utility app, which offers access updates, info, registration, how-to documentation, and MIDI protocol setups. The Mixfader is compatible with a variety of DJ applications including edjing Scratch, edjing Mix, and edjing Pro, as well as music creation software and apps, such as GarageBand, Serato DJ, Virtal DJ, Ableton Live, and Traktor DJ with more titles on the way. The Mixfader is also compatible with analog turntables with real vinyl or timecode vinyl for real-time A-level scratching and performance, including the portable Vestax Handy Trax or Numark PT01. The enclosure is made from unibody aluminum to resist shocks and provides ample weight to handle the back-and-forth movements of your hand. An adhesive and washable rubber back helps lock in the placement of the fader to any surface, allowing for sharp hand movements. Additionally, a set of 4 adhesive pads are included for attaching to your portable tablet / phone device to prevent their shake. The built-in Lithium-ion battery offers 20 hours of performance time and quickly recharges in 25 minutes. The Mixfader Dock replaces the switch of the Numark PT01 Scratch turntable for a permanent installation that provides the feel and grip of a full-sized crossfader. To install, simply unscrew the on-board switch and replace it with the Dock. The circular base fits perfectly on to the PT01 Scratch, allowing you to maintain a stable base no matter how hard you cut. Note: Mixfader or Numark PT01 Scratch turntable are not included. Box Dimensions (LxWxH) 17.7 x 14.4 x 5.7"
Box Dimensions (LxWxH) 6.45 x 4.85 x 2.3"
Box Dimensions (LxWxH) 5.0 x 4.5 x 0.2"